Conventional-style log cabin, homey and appealing, with two bedrooms, two baths, living room, dining area and kitchen; stone wood-burning fireplace, central A/C-heat. Living-dining room features a great stone wood-burning fireplace, polished oak floor, very comfortable queen sleep sofa, warm pine cabin furniture with large dining table that seats six. Corner kitchen off dining area is fully-equipped for all cooking/baking/microwaving, additional toaster oven and coffee maker. Pretty master bedroom on main floor has excellent queen bed and leather recliner for private lounging and reading. Shower bath is down a hallway near back door leading to a private courtyard. Off the dining area, carpeted stairs lead to a large full-size loft bedroom and a large bath. 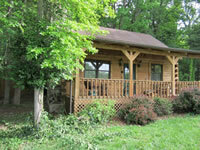 Fully furnished, the bedroom has a comfortable queen bed, rocking chair, and Direct TV. The Whitetail is reminiscent of the simple, tranquil country life as you swing or rock on the front porch, listen and watch for beautiful songbirds, deer and other wildlife that often wander across the meadow. Gather your energy and pitch a horseshoe game, or play a few rounds of Bocci ball. 'Tis the peaceful life at Pipestem Place on Anam Cara Way!